How many times have you traveled somewhere and had to lug heavy stroller systems or needed to find baby gear asap for your child? I've been there so many times and could not be more thrilled about the launch of a new App, goBaby, a mobile peer-to-peer marketplace for baby gear rentals! It was created by another woman in tech, Natalie Kaminski, who just like every mom on the go had the same issues with baby gear. "Traveling with kids is fun, but also stressful, and carrying a lot of luggage does not make it any easier," says Natalie Kaminski, the founder of goBaby. "We want family vacations to be as joyful and worry-free as possible, but we don't want parents to compromise their children's comfort and safety by not having the necessary equipment with them when they travel. goBaby connects traveling families with locals who are willing to lend their baby equipment. This way local families get to monetize on items they already own, while travelers get to travel light and worry-free." In addition to serving the traveling families, goBaby provides parents an opportunity to make money on the items they already own. Children grow fast, and baby gear is expensive, so instead of giving it away, selling it, or storing it in the basement, goBaby invites parents to list their no longer used baby items on the mobile marketplace and make some money while helping traveling families feel at home. goBaby Travel app can be downloaded on the App Store. 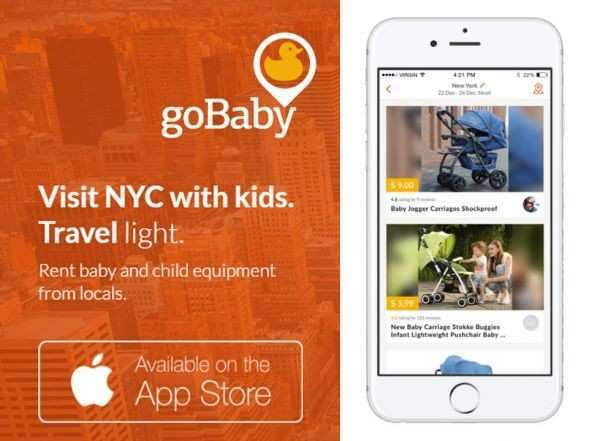 Check it out and if you know of a NYC baby gear rental location tell them about goBaby!